We hear a lot of complaints about remakes, sequels, prequels, and re-adaptations these days, as if they are some sort of new phenomenon. They've been a staple of film and television since the very beginning - did you know the Maltese Falcon was a re-adaptation, and they did it just ten years after the original film? - but there's one movie that holds a particularly special spot in this world. 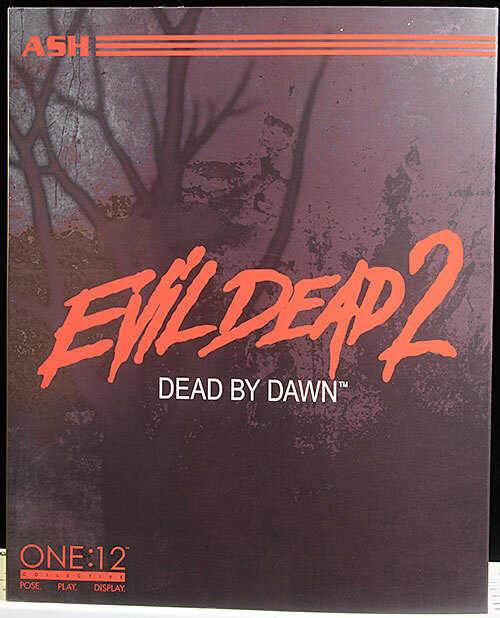 The Evil Dead II, or Evil Dead 2: Dead by Dawn as it was billed in much of the marketing, wasn't just a sequel, but a sequel and a remake at the same time. The first third of the movie remakes the original film. While Raimi has said the movie is just a straight up sequel, that's clearly not true - tons of things are altered, and not just for expediency. 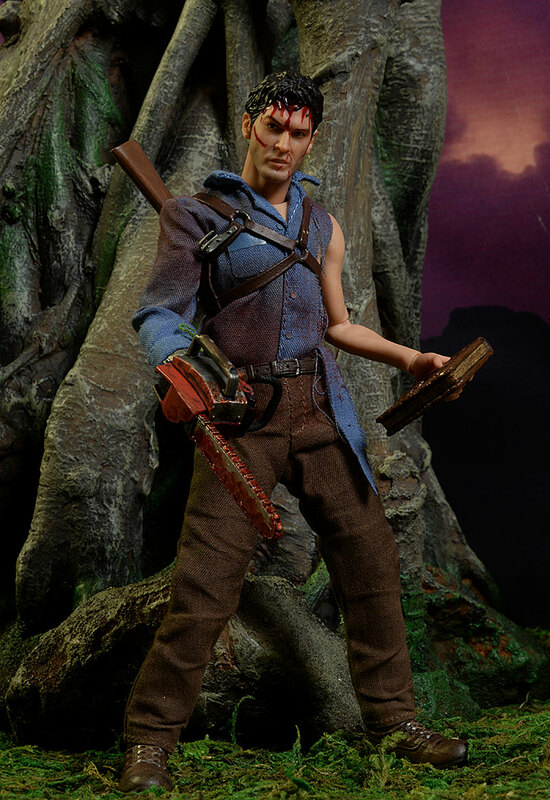 No, Evil Dead 2 remakes the first, and then takes off on its own wild ride, which would lead into the more humorous version of the Deadite Universe seen in Army of Darkness and Ash vs. the Evil Dead. It was a smart move, since the style better fit both Raimi's story telling and Campbell's acting. Still, I really enjoyed the 2013 remake, which took us back to a much more gritty 80's gore and horror style. We've gotten a decent share of collectibles based on the license, and this has increased in recent years thanks to the popularity of the Starz television show. 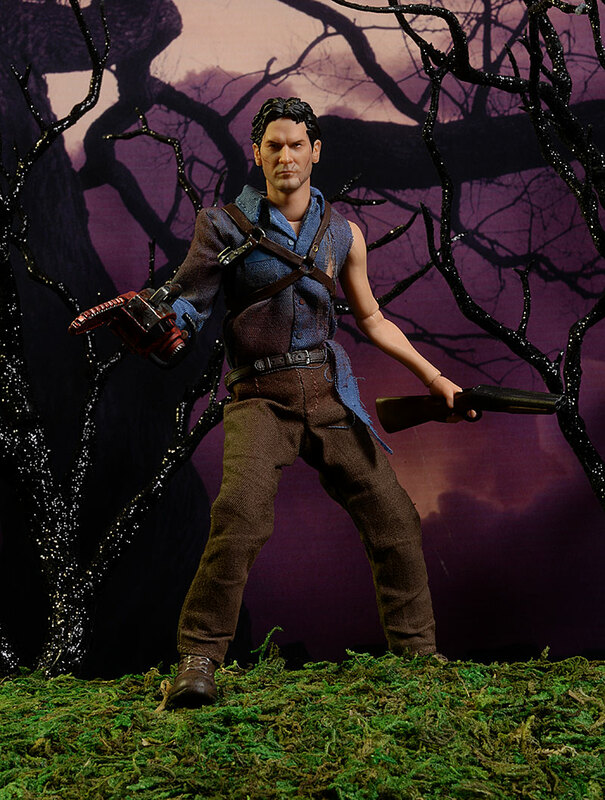 Mezco added an Ash to their One:12 Collective series, and this groovy figure just started shipping this week. Expect to pay around $80 for it, depending on the retailer. Sturdy, well made, and more elaborate than the usual DC or Marvel One:12 box, this is a great package. It's all collector friendly, although there is one piece of resealable tape holding in the smaller accessories. This movie was released in 1987, more than 30 years ago, as hard as that is to believe. Bruce Campbell has become much more recognizable in the intervening decades (he was great recently in the first season of Lodge 49), but remaining in the public eye means we best recognize him as he is now at 60, not in his twenties. You should go back and refresh your memory of his younger self to best judge these three portraits. Yep, there's three different head sculpts. This is one of the features I love the most about One:12 figures, and swapping between them is very, very easy. You'll be much more likely to do it on a regular basis thanks to this ease. It's also important to remember scale - this is a 1:12 scale figure, coming in at about 6 1/2" tall. He's much smaller than he looks in macro photos. The main head is slightly battered, with scratches and cuts. 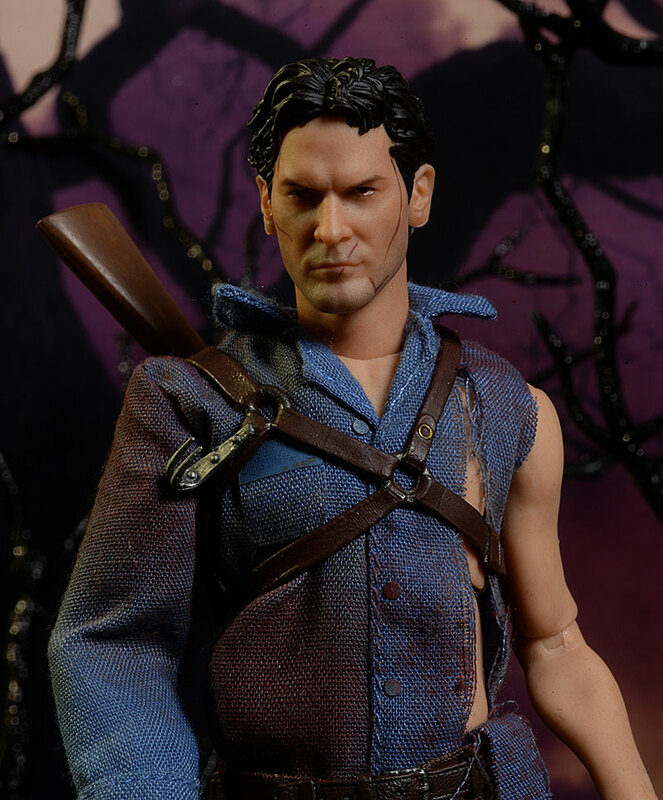 The hair is tousled, a look I like better than the neatly combed hair we saw on the Sideshow sixth scale version. He has the rocking heroic chin, properly shaped and scaled nose, and even ears that match reality. His expression is serious but there's a slight smirk on the lips, a Campbell tradition. The second portrait is the one I'll probably use the most, with more blood and wider eyes. He's looking off to one side, with an Elvis curl to his lips, wilder hair, all topped off with one raised eyebrow. This expression works with a ton of poses, and represents the character best for me. The third portrait is pretty specific - he's possessed. From a technical aspect, I like it the best. The work on the sunken skin and demonic eyes is amazing, and even the yellowed teeth are just about perfect. 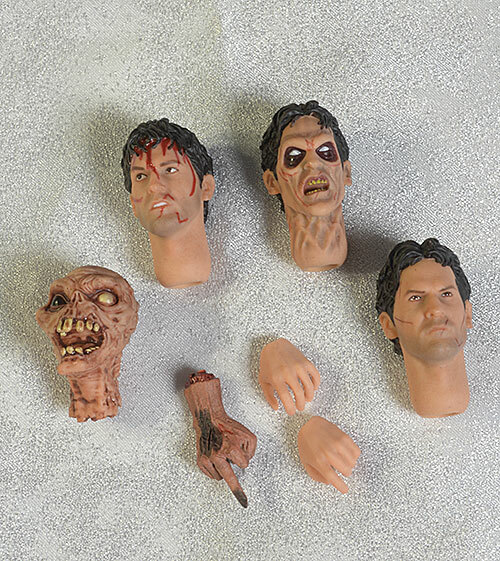 All three heads are a one piece design with the neck, and it's most notable with this third sculpt since it allows them to continue the creepy skin texture downward. These aren't perfect Campbell/Ash renditions, but they are damn close. Fans should be quite happy, particularly in hand where the scale becomes more of a factor. As I said, he stands about 6 1/2" tall fully upright. The hands are sculpted to work with the accessories, and the rest of the sculpting - including the boots - is excellent. More on that in the Outfit section. One of Mezco's goals with this series is to bring high quality paint applications to the 1/12 world. They've done it more often than not, and this is another great example. The least damaged portrait has narrow, clean eyes, sharp eyebrows, and just a hint of five o'clock shadow. The lips are clearly defined, but not so much as to appear like lipstick. 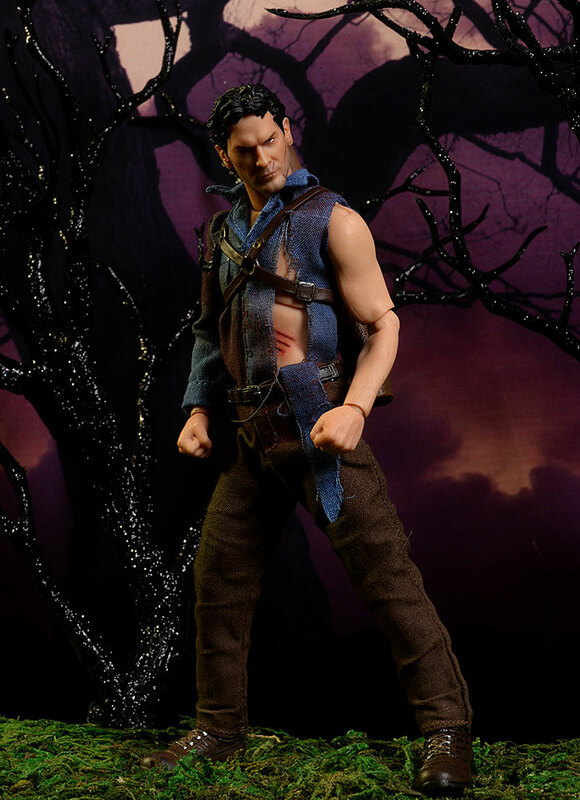 The scratches look realistic, and the skin tone is great. The more damaged face is even better. The wider eyes show off the whites and black pupils, and the teeth are barely visible yet perfect within the mouth. The skin texture and shadowing are great again, and the heavier blood pattern has a translucent, wet look that I really like. It does look a little 'painted on' (and yes, there's bloody cuts on the torso too), but considering the scale it's much better than we usually see. Then we have the possessed look, with craggy skin and sunken eyes. The paint work on the face is excellent, including the yellowed, nubby teeth. The dark black around the eyes is consistent in coverage, and the white eyes are super clean and neat. No surprises with the underlying body and corresponding articulation, but some joints become more or less of an issue depending on the character. I like the design of the ball neck joint, with the long post and single neck/head design. I was able to get enough lean and tilt action to make me happy, and the heads were quite easy to swap. The rotating hinge shoulders can be tough to work with, and the rotating hinge elbows and wrists don't really provide a great enough range of movement. The elbows are the one area where improvements are worth making, and should be. The torso leans and tilts, and I was able to get some decent crunch action. The hips and knees allow for shallow to deep stances, and the nice two piece boot design gives the ankles plenty of room to move, including side to side. This guy is well packed with all the extras you expect. I already mentioned the two extra head sculpts, a huge plus in my book. All three looks are useful too, making them all the more valuable to include. There's not a ton of hands, but since he chopped off his right in the film, it's not too surprising. He comes wearing a set of fists, and there's an extra gun grip left and wide grip left. These two lefts will allow him to hold a couple of the other accessories. 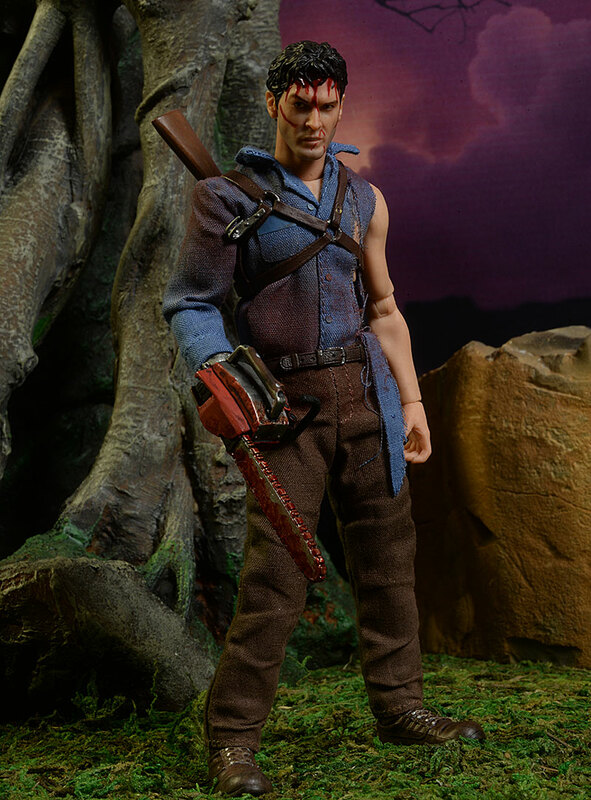 While there technically aren't any extra right hands, he does have the critical chainsaw, which replaces his right hand for much of the movie. 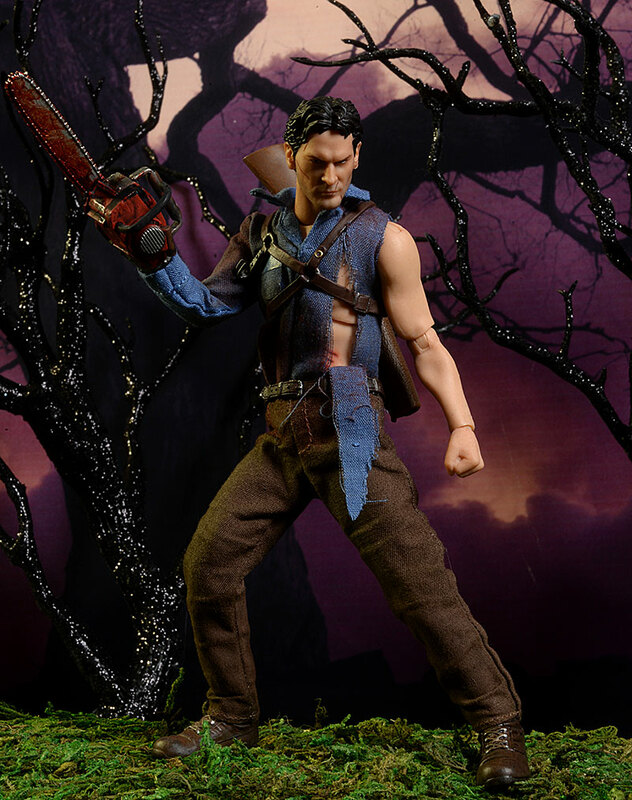 The sculpt is reasonable, and there's plenty of blood. 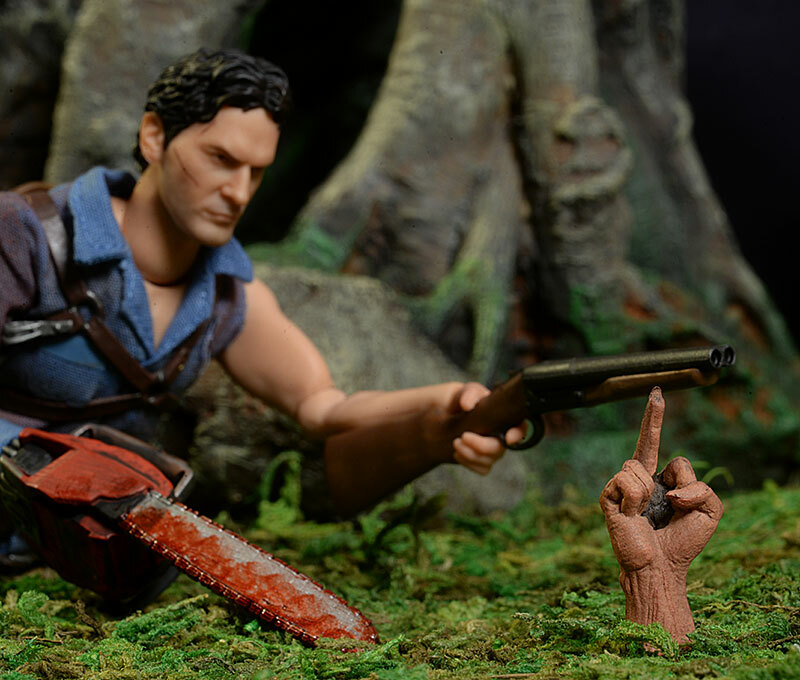 Speaking of his severed hand, that little devil is included as well, flipping off poor Ash as he tries to blast it to Hell. 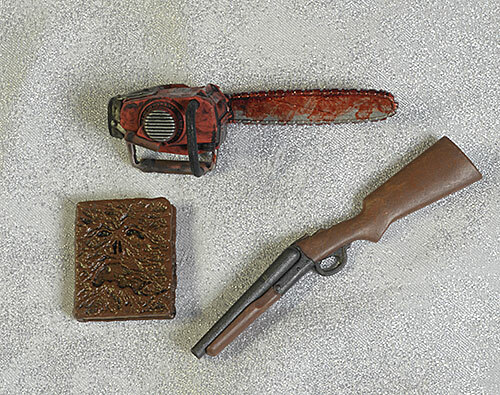 He also has his boomstick, the sawed off shotgun he can wield in one of the left hands, or wear on his back. The marketing docs mention he comes with a 'severed Deadite head', but more specifically, this is Henrietta. She's a pretty recognizable character, and she was important enough to pop up again in the television series. You can't have Ash without the book that started it all - the Necronomicon, or Book of the Dead. 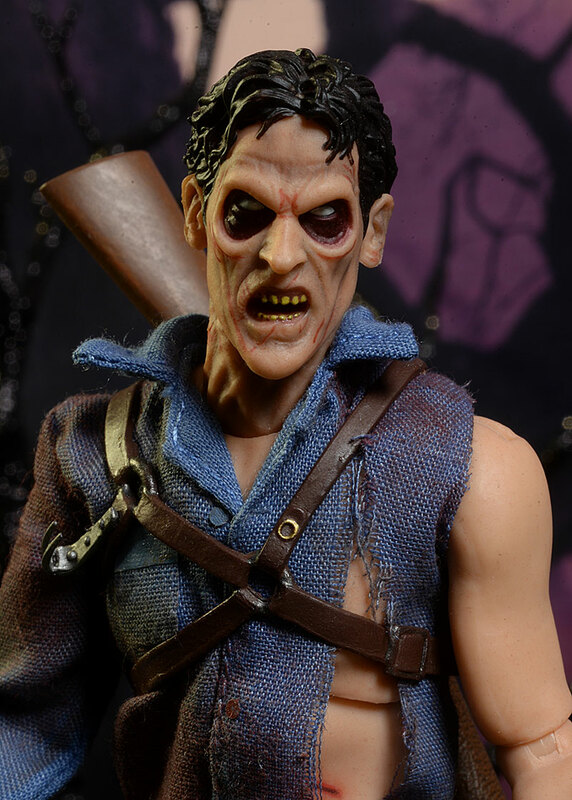 The sculpt looks great, complete with creepy face on the cover. Finally, he has the usual One:12 Collective display stand, and you can use either the larger clear support rod, or the simple foot peg. Or neither - he stands great on his own too. The one area where I have a few nits this time is the outfit. It consists of the shirt, pants, belt, sculpted boots, and harness/holster. The boots are terrific, with an excellent sculpt and a nicely designed two piece construction that looks great and still allows for plenty of ankle movement. The pants and belt are, well, pants and a belt. The fit is good, and the wear and tear reasonable. The shirt is much more torn up, as you'd expect, and the pattern is pretty consistent with the on screen look, which varied through the movie. The biggest hunk of ripped material is actually tacked to the pants to hold it in place. There's a nice dirt effect on the shirt as well, but I'm not loving the collar. It's too large, tends to stick up too much (although you can tack the edges down with the harness), and throws off the overall look for me. The harness looks good and fits tightly, but the holster for the shotgun is fairly large, since it's made from plastic rather than a soft goods material. You won't see it a lot, and it does hold the gun well, but I think some sort of pleather material would have looked better. Lots of accessories, multiple useful heads, decent articulation - this is a fun figure for young and old alike. 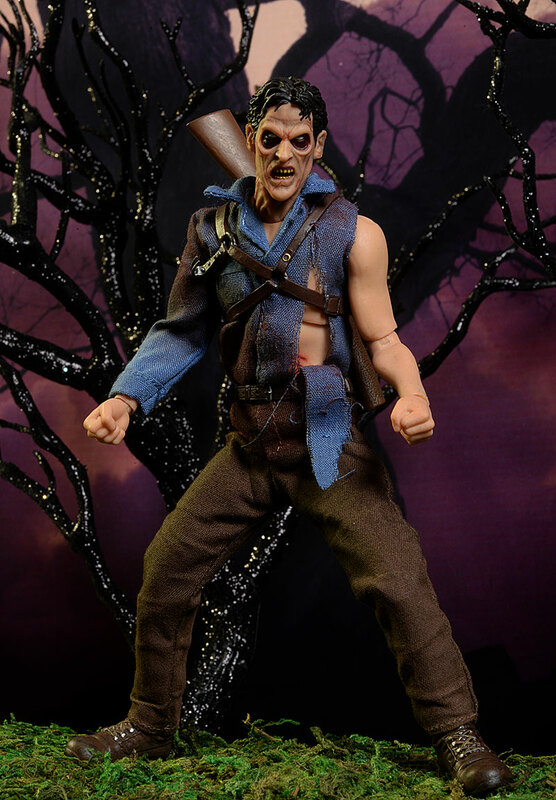 Pick up some 6 - 7" zombies and undead characters to pair with him in the display, and you'll have a ton of fun coming up with various scenarios. At $80, he's at the new average price for these guys. I'm not quite sure I'm good with this price tag yet, but this character certainly justifies it. He has multiple heads and a ton of other extras, and he's not going to be one they make thousands of, either. That gives them fewer units to spread the fixed costs, making the price more understandable. Not a thing. Everything is sturdy, and I had no trouble working with the figure or the accessories. I don't expect to get another One:12 figure from this license, and I'm perfectly fine with that. I don't need twelve characters from a movie to feel complete, particularly when one character is so key to the overall story. This is exactly the sort of figure I'm drawn to, far moreso than the 50th Batman or 60th Iron Man or 100th Stormtrooper. Give me more leading characters from a greater variety of movies and tv shows, and I'll be a very happy camper. 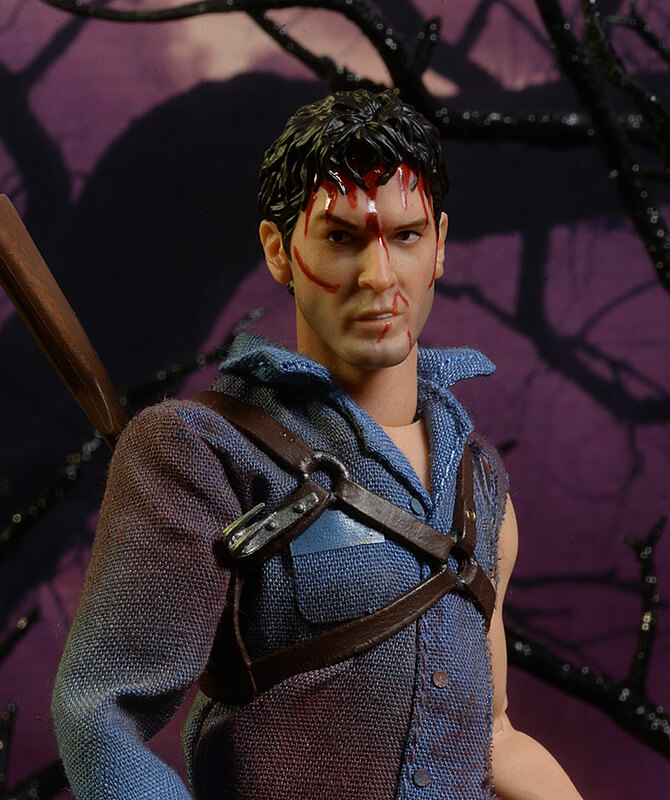 Once upon a time McFarlane did Movie Maniacs, SOTA did Now Playing, and NECA did Cult Classics, all catering to exactly this sort of character, and the more we get from Mezco in the One:12 series, the happier I'll be. - Entertainment Earth is also at $80. 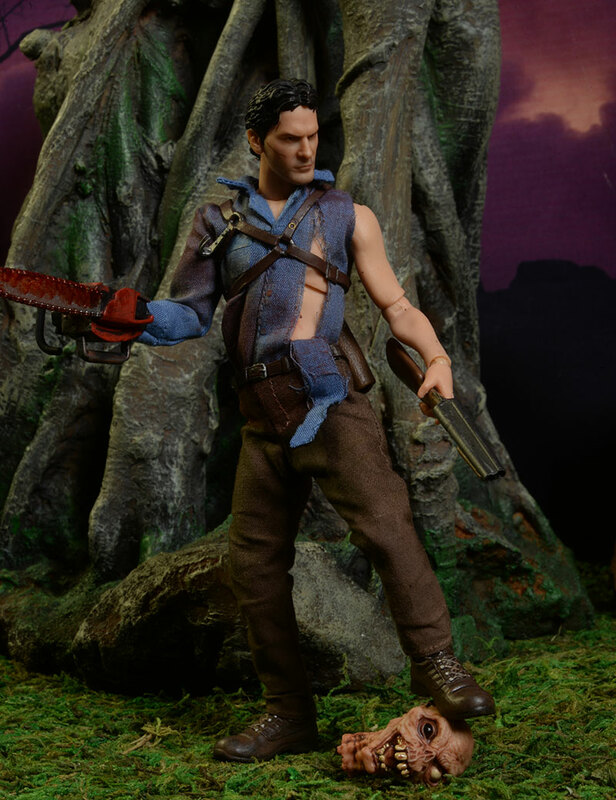 If you're an Ash fan, but want something a bit bigger, check out the recent sixth scale figure from Sideshow.